Editor’s Note: This is a guest post from Alex Craig of Have a Rich Marriage. Let’s be honest, money causes conflict in all of our marriages. It causes conflict because nobody has taught us how to handle or respond to money, especially not in our marriages. If we really want to stop fighting about money, we have to rewire our brains and understand how behaviors and habits form. Today I am going to show you how behaviors occur and how to stop fighting about money in your marriage. You might think your behavior is random and your response is happen chance, but your behavior is a response to your situation or environment. When the light turns green, what do you do? You start driving. The green light signals to our brains that it is time to go. There are green lights throughout every area of our life that tell us how to behave. Many spouses understand that their conflict behaviors are irrational. There is a ton of information out there on the internet that tells us about the proper behaviors, but very little information on how to act out those behaviors. Many of us know what we SHOULD be doing, but do we don’t do it. If information alone was enough, then you would not have fat dietitians or poor financial advisors. It’s because it is a mind game. You work on changing your money or conflict habits, but changing habits and behaviors are hard. You do not know why your behaviors occur. It is like trying to bake a cake without knowing a single ingredient that goes into it. Good luck. All behaviors start with a cue in the environment that tell us how to respond. 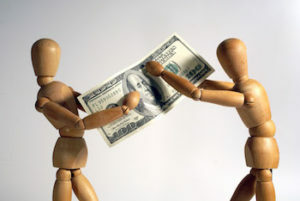 For example, when your spouse overspends, that is when your conflict behaviors are engaged. Your response to your spouse overspending is stonewalling, yelling, or giving your spouse the cold shoulder. If your behavior to a cue is argument then work on getting rid of the cue. I will show you more below about how to remove the common cues when it comes to fighting about money. So you know a behavior occurs in response to a cue, but what determines the behavior? Through trial and error, your brain learns to behave to get the desired end results. All of us have the same end results, to have a happier marriage, to be healthy, to be financially secure, and more. We act to bring ourselves closer to those end results. If it doesn’t bring us closer, then we try a new behavior, until eventually we learn a behavior that brings us closer to our goals. Going back to the driving example. Why do you go when the light turns green? Obviously you were taught that, but we choose to drive when the light is green because it will move us closer to our destination. We stop on a red light because we are afraid to get hit or get a ticket. So when your spouse overspends, this is the cue to signal a behavior, that behavior is carefully chosen to reward your brain. What is your reward when you fight? You think it will change your spouse, it feels better to hurt someone when they hurt you, or you think it will make your marriage happier. So if you want to stop fighting, then you have to figure out what the reward is form a different behavior that is healthy for your marriage that still moves you toward your end result. Now that we know our conflict behaviors only occur from our signals and desired end results, we can seek to change those because they will change our behaviors. Here is my roadmap to stop fighting in your marriage about money. I call it my DESIRE strategy. There are no shortcuts and still requires hard work, but have a compounding effect. A lot of couples fight about a spouse overspending, spending money on useless purchases, keeping purchases kept secret, or more. The bottom line is that, spouses want to have more money left over to support both of their end results. One spouse might want to save for a vacation to take a break from their job that causes a lot of stress while another spouse wants to buy new clothes. If there is not enough money, then spouses will argue that they both overspend. If you want to stop fighting, you can work on spending less, but there is more than just creating a budget and spending less because spending less is also a behavior that needs to be modified through cues and end results. For example, I know plenty of people who overspend because they have a strong desire for status. They buy the nicest houses, the nicest cars, and the nicest anything you could possibly buy. A budget will never work for this type of spender. They will need to deal with their money mindset or start working harder on strategy two. I prefer this strategy than the spend less strategy. Cutting costs can only get you so far, but there is no cap on how much you could earn. When my wife and I fought about money a lot when we first got married. We were the definition of young, broke, and in love, but our financial situation caused a huge fracture in our marriage. When we started earning more and more, I realized we began fighting less and less, so to see if earning more was a causation of fighting less, I sought to earn more money. Eventually we earned enough money to support both of our desired end results and fighting about money has not occurred in the last year. There are many ways you can earn more money, I show people how to manage their money and earn more, and the best part is that it does not involve donating any of your bodily fluids. Continue to the bottom for your free gift. Simplification is the key to an easier life and a happier marriage. Our lives have gotten complicated and the personal finance world does not help. They talk and talk in jargon about things like PE Ratios and amortization rates. A majority of this stuff goes over our heads. You might keep a budget that is way too complicated. I use to keep a budget with a ton of complex financial calculations that always told me the same thing, I was broke. We have since simplified our finances, and I spend less than an hour per month on my finances and I am still in complete control. The important thing to realize about my DESIRE Strategy is that it is a loop. You can and should go through this loop constantly trying to improve each area. Find out how you can spend less and less. Find out how you can earn more and more. Find out how you can make your finances simple. If you want to learn the exact strategies on how to earn more money, save more, and simplify your finances, you can click the link below to get my free e-book, “Money Management Made Simple”. Alex Craig is the founder of Have a Rich Marriage, which helps couples live a fuller and more rich marriage, whatever that means for them. To this date, Alex has helped many live marriage on their terms rather than on the world’s terms. The post How to Stop Fighting About Money in Your Marriage appeared first on Simple Marriage.